John Kedzie Jacobs, The Stranger in the Attic: Finding a Lost Brother in His Letters Home (Lexington, KY: Jacobs, 2013). At the end of his physical strength, the Lincoln volunteer Edward Deyo Jacobs was too exhausted to continue running away from the encircling enemy armies during the Retreats of March 1938. His close friend and fellow artist Doug Taylor elected to stay with him. They were both swept up by the advancing Nationalists and neither was ever heard from again. 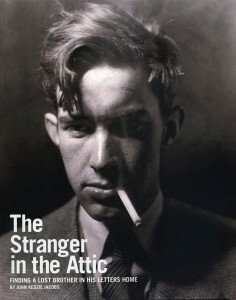 Now, in The Stranger in the Attic, John Kedzie Jacobs, Edward’s older brother, provides the previously missing story behind the story, using a framework based on letters John Jacobs found in the attic of his family home. These letters written by and to Edward, include those from his friends and family beginning during his childhood in upstate New York and continuing until shortly before his death. John Jacobs does an exceptional job interweaving family history and the letters. After graduating from high school, Edward enrolled in the Art Students League in Manhattan. He grew into a talented artist who signed his work Deyo. Jacobs’s letters from New York deal with diverse subjects, including learning about art, life, and making a living during the Great Depression. In 1935, he and Doug Taylor rode the rails to Salt Lake City. The same year he joined the Communist Party. Edward Jacobs volunteered when the Spanish Civil War broke out and the Communist Party began to recruit volunteers for the International Brigades. He arrived in Spain in early March 1937. Jacobs served on the Jarama Front, at Fuentes de Ebro, Teruel, and the Retreats. His roles were varied and included those of rifleman, staff artist, and topographer. While Jacobs’s letters from Spain make up only a small portion of The Stranger in the Attic, they provide greater insight into his service in Spain. When family and friends ceased to receive letters, their hope gradually turned to grief. The Stranger in the Attic is a powerful addition to the growing library on Spanish Civil War volunteers. It is both a celebration of life and a poignant reflection of an older brother lost in a foreign war and the subsequent impact on his family. Chris Brooks, a longtime Board member, directs ALBA’s biographical dictionary project.